Flames Rising is pleased to announce the latest release in the Instant Antagonists line. Instant Antagonists are systemless creatures or beings designed for use in existing modern supernatural/horror games. Many will be supernatural in nature; some will be (at least nominally) human. While one antagonist may be truly evil, others are simply selfish, immoral or may even be victims themselves. Looking for a new twist on an old legend or trope? This product is a perfect addition to a GM’s modern horror game collection. The Instant Antagonists line offers details on each monster’s origins, powers and plenty of story hooks to include them in your campaign or evening’s session. At first glance, Queenie looks like any other cottontail — but is he? Come a little closer and see for yourself why this nefarious hare has cultists (and non-cultists alike) running around in circles. Is an Outer God really trapped inside the body of a fluffy bunny rabbit? Will he enslave the minds of pet store owners everywhere? Or will The Creepy Cottontail entice a small town’s population to turn on each other in a bloody fight to the finish? The Creepy Cottontail author, Monica Valentinelli (and Flames Rising project Manager) shares some notes on the design and writing process that went into this product. A heavy-handed Lovecraft influence combined with my love of animals shaped the latest addition to FR Press’s line. Dubbed “The Creepy Cottontail,” you’ll find this is no ordinary bunny rabbit. After all, when a particular Outer God screws up, as the opening fiction suggests, there’s no telling what will happen. While the idea of a cute, bunny rabbit crossed with Lovecraft may seem like a cosmic joke — take it from the cottontail’s perspective for a second. You’re small. If you’re out in the wild, you can escape most people’s attention. If you’re someone’s pet, you have a captive audience. Now add psychic powers on top of that. And cultists. And psychically-controlled cultists. Suddenly, what appears cute and harmless turns into something truly terrifying. And that, my fellow gamers, is the point of The Creepy Cottontail. In this case, it’s not about what you expect. It’s about what you don’t. Since FR Press wants to move forward with the line, I decided to make a few changes based on reviews. (Incidentally, this product is just one of many that are planned behind-the-scenes, so your feedback will be crucial to ensuring these systemless products are useful for your game.) The size of this Antagonist is double that of the original and we added a Table of Contents to help you reference the product a little easier. Then, I decided to separate the character portion of the creature from the plot-related items. In my mind, I viewed the character development to be separate from how The Creepy Cottontail might fit into your game. In this way, I hoped to highlight the difference between statting up and describing a bad guy versus deploying him into your story. For the plot portion, I decided against using story hooks because I found I was populating those ideas throughout the product and didn’t want to bore you with repetition. Instead, I added tips on how to blend each Origin story into your game from both the cultist’s and the non-cultist’s point-of-view. Genres and Plot Twists are new this time around and they are exactly as they sound. While this product is skewed for modern horror, I couldn’t help but pop in a few options for other styles of play, too. To address the GM’s potential concerns, I also added a Troubleshooting section designed to anticipate some common errors, opportunities and frustrations. This isn’t the first time I blended an animal’s perspective with Lovecraft. 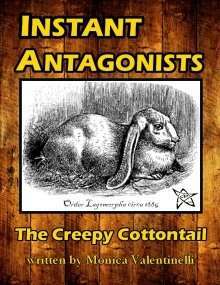 So if you like the idea behind The Creepy Cottontail, don’t be afraid to listen to Prey on Pseudopod.org for free. I sincerely hope you’ll consider picking up this addition to the Instant Antagonists line. If you do? I encourage you to review the product to help shape its future. After all, this product isn’t for me. It’s for you. You can purchase The Creepy Cottontail today at the Flames Rising RPGNow Shop.